At long last, I have posted version 1.0 of my DAECleaner Adobe AIR application, expressly designed to help you strip out the extraneous XML from within your Collada/DAE files. 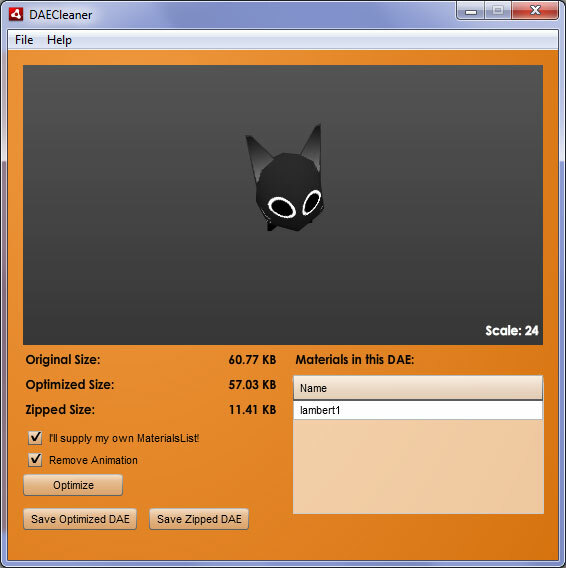 It also has the ability to save your DAE within a zip file, you can then use my DAEz class to provide transparent loading of the zipped DAE models. In my on-going quest to improve load times when dealing with Collada (DAE) models in Papervision3D, I decided to write a DAE file cleaner (or optimizer) in Adobe AIR that will remove extraneous information from the DAE file that Papervision3D ignores anyway. I do all my modelling in 3DS Max 2010 and it exports lights and so forth that are unused in pv3d and might as well be removed to save on filesize. Additionally, and more to the point of what this post is all about, I have written a new class for Papervision3D which extends the DAE class and provides for loading zipped DAE files – this *really* crunches down the file size. See example usage here and download a copy below! Download the DAEz class here! And check back real soon for the DAE Cleaner utility!